American test pilot astronaut 1980-1994. Status: Inactive; Active 1980-1994. Born: 1946-08-19. Spaceflights: 4 . Total time in space: 28.36 days. Birth Place: South Carolina. In 2002, Bolden was nominated by President Bush to be NASA's deputy administrator but in the wake of the 11 September 2001 terrorist attacks and the impending war in Afghanistan, this nomination was withdrawn to allow Bolden to continue his military service. Bolden retired from the Marine Corps after a 34-year military career with the rank of Major General in 2003, then became the president and chief operating officer of American PureTex Water Corporation and Pure Tex Water Works. He also served as senior vice president of TechTrans International, a language service company which served primarily as a subcontractor to NASA JSC to support joint Russian/US space programs. On 17 Dec 2004 Bolden joined the GenCorp Inc board of directors. Nominated by President Barack Obama and confirmed by the U.S. Senate, retired Marine Corps Major General Charles Frank Bolden, Jr., began his duties as the twelfth Administrator of the National Aeronautics and Space Administration on July 17, 2009. As Administrator, he leads the NASA team and manages its resources to advance the agency's missions and goals. Bolden's confirmation marks the beginning of his second stint with the nation's space agency. His 34-year career with the Marine Corps included 14 years as a member of NASA's Astronaut Office. After joining the office in 1980, he traveled to orbit four times aboard the space shuttle between 1986 and 1994, commanding two of the missions. His flights included deployment of the Hubble Space Telescope and the first joint U.S.-Russian shuttle mission, which featured a cosmonaut as a member of his crew. Prior to Bolden's nomination for the NASA Administrator's job, he was employed as the Chief Executive Officer of JACKandPANTHER LLC, a small business enterprise providing leadership, military and aerospace consulting, and motivational speaking. After returning to the U.S., Bolden served in a variety of positions in the Marine Corps in California and earned a master of science degree in systems management from the University of Southern California in 1977. Following graduation, he was assigned to the Naval Test Pilot School at Patuxent River, Md., and completed his training in 1979. While working at the Naval Air Test Center's Systems Engineering and Strike Aircraft Test Directorates, he tested a variety of ground attack aircraft until his selection as an astronaut candidate in 1980. Bolden's NASA astronaut career included technical assignments as the Astronaut Office Safety Officer; Technical Assistant to the Director of Flight Crew Operations; Special Assistant to the Director of the Johnson Space Center; Chief of the Safety Division at Johnson (overseeing safety efforts for the return to flight after the 1986 Challenger accident); lead astronaut for vehicle test and checkout at the Kennedy Space Center; and Assistant Deputy Administrator at NASA Headquarters. After his final space shuttle flight in 1994, he left the agency to return to active duty the operating forces in the Marine Corps as the Deputy Commandant of Midshipmen at the U.S. Naval Academy. Bolden was assigned as the Deputy Commanding General of the 1st Marine Expeditionary Force in the Pacific in 1997. During the first half of 1998, he served as Commanding General of the 1st Marine Expeditionary Force Forward in support of Operation Desert Thunder in Kuwait. Bolden was promoted to his final rank of major general in July 1998 and named Deputy Commander of U.S. Forces in Japan. He later served as the Commanding General of the 3rd Marine Aircraft Wing at Marine Corps Air Station Miramar in San Diego, Calif., from 2000 until 2002, before retiring from the Marine Corps in 2003. Bolden's many military decorations include the Defense Superior Service Medal and the Distinguished Flying Cross. He was inducted into the U.S. Astronaut Hall of Fame in May 2006. Bolden is married to the former Alexis (Jackie) Walker of Columbia, S.C. The couple has two children: Anthony Che, a lieutenant colonel in the Marine Corps who is married to the former Penelope McDougal of Sydney, Australia, and Kelly Michelle, a medical doctor now serving a fellowship in plastic surgery. BIRTHPLACE AND DATE: Born August 19, 1946, in Columbia, South Carolina. His mother, Ethel M. Bolden, resides in Columbia. PHYSICAL DESCRIPTION: Black hair; brown eyes; 5 feet 7 inches; 155 pounds. EDUCATION: Graduated from C. A. Johnson High School in Columbia, South Carolina, in 1964; received a bachelor of science degree in electrical science from the United States Naval Academy in 1968, and a master of science in systems management from the University of Southern California in 1977. MARITAL STATUS: Married to the former Alexis (Jackie) Walker of Columbia, South Carolina. CHILDREN: Anthony Che, June 9, 1971; Kelly M., March 17, 1976. RECREATIONAL INTERESTS: He enjoys racquetball, running, soccer, swimming, and first day cover collecting. ORGANIZATIONS: Member of the Marine Corps Association, the Montford Point Marine Association, the U.S. Naval Institute, and Omega Psi Phi Fraternity. Lifetime member of the Naval Academy Alumni Association, the University of Southern California General Alumni Association. SPECIAL HONORS: Recipient of the Defense Superior Service Medal, the Air Medal, the Strike/Flight Medal (8th award), the University of Southern California (Ebonics Support Group) Outstanding Alumni Award (1982), National Technical Association Honorary Fellow (1983), Honorary Doctor of Science Degree from the University of South Carolina (1984), Honorary Doctor of Humane Letters from Winthrop College (1986), the NASA Exceptional Service Medal (1988), and the University of Southern California Alumni Award of Merit (1989), and an Honorary Doctor of Humane Letters from Johnson C. Smith University (1990). EXPERIENCE: Bolden accepted a commission as a second lieutenant in the U.S. Marine Corps following graduation from Annapolis in 1968. He underwent flight training at Pensacola, Florida, Meridian, Mississippi, and Kingsville, Texas, before being designated a naval aviator in May 1970. He flew more than 100 sorties into North and South Vietnam, Laos, and Cambodia, in the A-6A Intruder, while assigned to VMA(AW)-533 at Nam Phong, Thailand, June 1972 - June 1973. Upon returning to the United States, Bolden began a two-year tour as a Marine Corps officer selection officer and recruiting officer in Los Angeles, California, followed by three years at the Marine Corps Air Station, El Toro, California. In June 1979, he graduated from the U.S. Naval Test Pilot School at Patuxent River, Maryland, and was assigned to the Naval Air Test Center's Systems Engineering and Strike Aircraft Test Directorates. While there, he served as an ordnance test pilot and flew numerous test projects in the A-6E, EA-6B, and A-7C/E airplanes. He has logged more than 5,000 hours flying time. 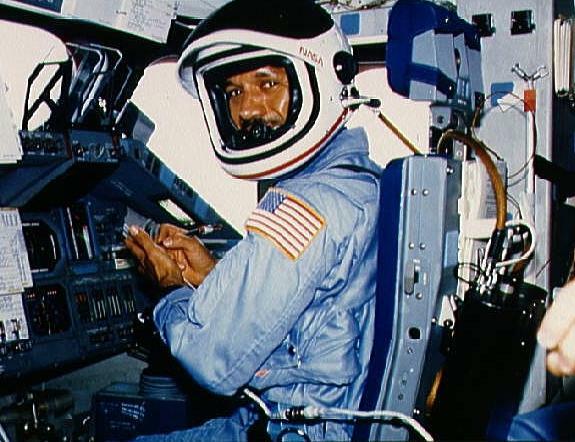 NASA EXPERIENCE: Selected by NASA in May 1980, Bolden became an astronaut in August 1981, qualified for assignment as a pilot on future Space Shuttle flight crews. His technical assignments to date include: Astronaut Office Safety Officer, Technical Assistant to the Director of Flight Crew Operations, Special Assistant to the Director of the Johnson Space Center, Astronaut Office Liaison to the Safety, Reliability and Quality Assurance Directorates of the Marshall Space Flight Center and the Kennedy Space Center, Chief of the Safety Division at JSC, and Lead Astronaut for Vehicle Test and Checkout at the Kennedy Space Center. A veteran of three space flights, Bolden served as pilot on STS 61-C (January 12-18, 1986) and STS-31 (April 24-29, 1990), and was the mission commander on STS-45 (March 24 - April 2, 1992). On his first mission Bolden was pilot on the crew of STS-61C, aboard the Space Shuttle Columbia. During the six-day flight crew members deployed the SATCOM KU satellite and conducted experiments in astrophysics and materials processing. STS 61-C launched from Kennedy Space Center, Florida, on January 12. The mission was accomplished in 96 orbits of Earth, ending with a successful night landing at Edwards Air Force Base, California, on January 18, 1986. He next served as pilot on the crew of STS-31, aboard Space Shuttle Discovery, which launched on April 24, 1990, from the Kennedy Space Center in Florida. During the five-day mission, crew members deployed the Hubble Space Telescope, and conducted a variety of middeck experiments. They also used a variety of cameras, including both the IMAX in cabin and cargo bay cameras, for Earth observations from their record-setting altitude over 400 miles. Following 75 orbits of the earth in 121 hours, STS-31 Discovery landed at Edwards Air Force Base, California, on April 29, 1990. More recently, Bolden commanded a crew of seven on STS-45 aboard the Space Shuttle Atlantis. Launched on March 24 from the Kennedy Space Center in Florida, STS-45 was the first Spacelab mission dedicated to NASA's Mission to Planet Earth. During the nine-day mission, the crew operated the twelve experiments that constituted the ATLAS-1 (Atmospheric Laboratory for Applications and Science) cargo. ATLAS-1 obtained a vast array of detailed measurements of atmospheric chemical and physical properties, which will contribute significantly to improving our understanding of our climate and atmosphere. In addition, this was the first time an artificial beam of electrons was used to stimulate a man-made auroral discharge. Following 143 orbits of Earth, STS-45 Atlantis landed at the Kennedy Space Center, Florida on April 2, 1992. With the completion of his third mission, Bolden has logged over 481 hours in space. Departed Date: 1994-06-27. Marital Status: Married. Children: Two children. Education: Annapolis;Caltech;Patuxent. Family: Astronaut. Country: USA. Flights: STS-61-C, STS-61-J, STS-31, STS-45, STS-60. Projects: STS. Agency: USMC. Bibliography: 12, 5182. 1946 August 19 - . 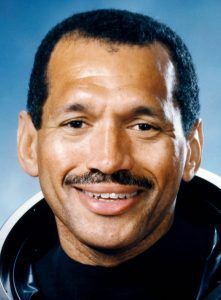 Birth of Charles Frank Jr 'Charlie' Bolden - . Nation: USA. Related Persons: Bolden. American test pilot astronaut 1980-1994. 4 spaceflights, 28.4 days in space. Flew to orbit on STS-61C (1986), STS-31, STS-45, STS-60..
1992 April 2 - . Landing of STS-45 - . Return Crew: Bolden, Duffy, Foale, Frimout, Leestma, Lichtenberg, Sullivan. Nation: USA. Related Persons: Bolden, Duffy, Foale, Frimout, Leestma, Lichtenberg, Sullivan. Program: Spacelab. Flight: STS-45. STS-45 landed at 11:21 GMT. .